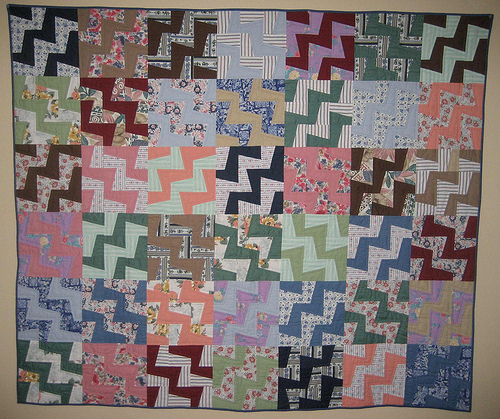 "I have quilts or quilt tops made by my grandmother, great grandmother & great grandmother. The quilting bug skipped my Mom -- though she did piece some blocks, guided by her grandmother. It was a stack of her 4-patch blocks that started me quilting. I set them together in the late 70s and I was hooked." "I love geometry & pattern, a big field of repeating shapes makes my heart sing. I also love cloth & color. Put these together & you have Quilting! Put me in my sewing room playing with fabric, in front of my sewing machine joining pieces & you will see a Very Happy Person!" "I guess my quilting motto would be "Don't worry". I sometimes see people truly stressed about color placement or seam alignment -- it makes me sad. 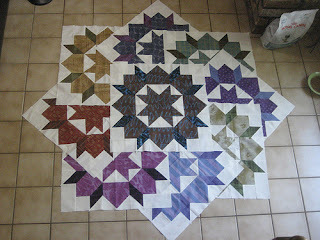 I wish they could find joy in the clashing colors, in their wonky (or not wonky enough) seams. 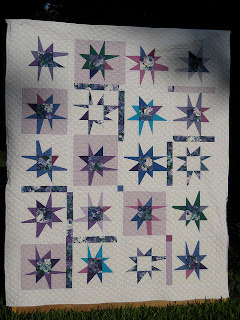 Quilting is fun! 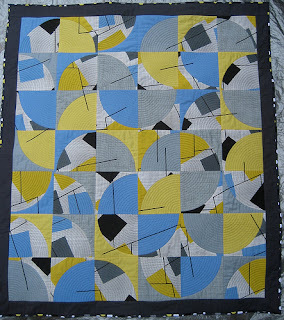 Quilting is play!" "I have a whole fleet of sewing machines -- though truthfully, only 3 are my real day-to-day machines, each with their specialty. 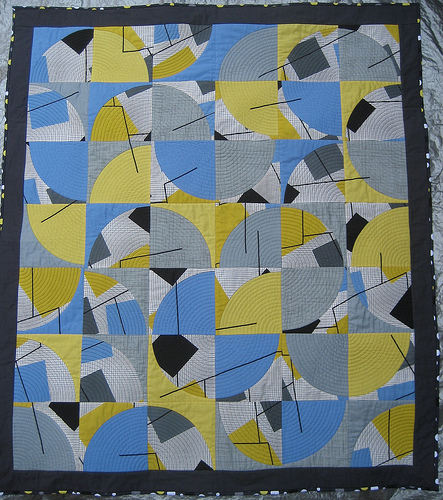 I would wish at least 2 machines for every quilter -- unfortunately, machines do sometimes need some medical attention; with 2 machines, you should never be unable to sew." "My music tastes are as varied as my fabric preferences. I love Lyle Lovett, Pink Martini, Dinah Shore, ZZ Top, Queen, the Beatles. But often I just sew in the peace & quiet of my room." "Now we have 2 cats. The calico (of course! all quilters should have a calico! ), Pippa, is often helping or hindering me when I sew. The tuxedo, Louis, sometimes drops by to stir things up. All my fabric has a scrim of cat hair." 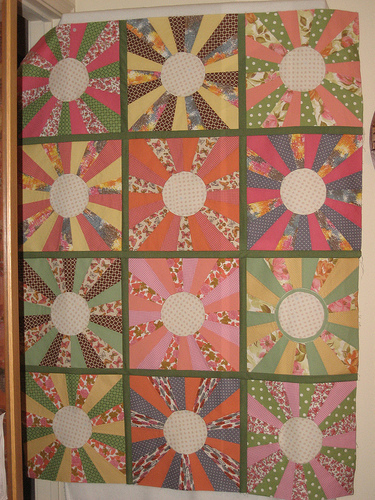 "I wanted Rachael's cottage to be made of daisies -- & some bluebonnets to represent me in Texas, to be slightly traditional but kind of not traditional & to have a wild-ish combination of pattern (I don't have her skill for exuberant pattern & color combinations, but I am working on it!). I started thinking of her collection of houses as Daisy Town & as I made my block, I kept singing to myself about it to the tune of "Funky Town"! I think it will be a fun place to live!" Thank you Beth!! Blue Bonnets and Blue Daisies rock the house together!!! Hello happy smiley door. I love that this house block is so modern and yet honours tradition with HST's used for the roof. And don't you think the roof looks a bit like a sail boat, which is so perfect because I recently discovered Beth enjoys sailing. So are you wondering why Beth's blog is called Smazoochie? to find out pop over here and you'll find out. Another great interview, with Beth today! Funky Town is growing beautifully! Off to visit Smazoochie! 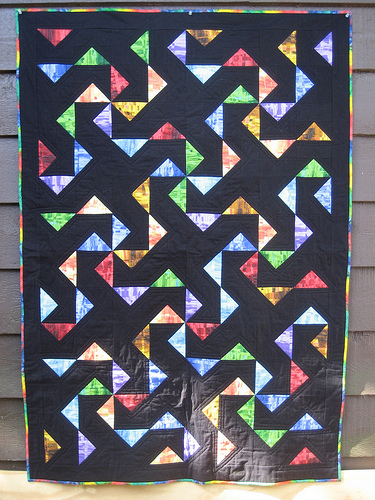 I love the quilts Beth makes but even better, I love her attitude. She made you a great block. 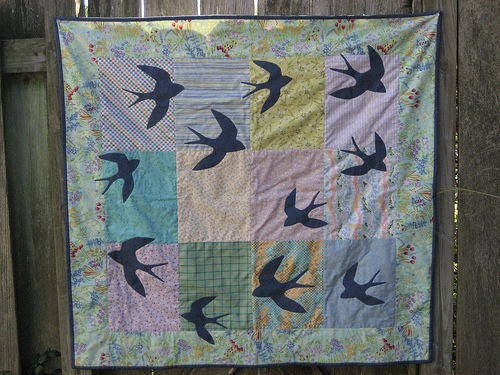 Love Beth's quilts and her interview. The house block is super fun and different. I'm off to read about "Smazoochie"! So much eye candy!!! 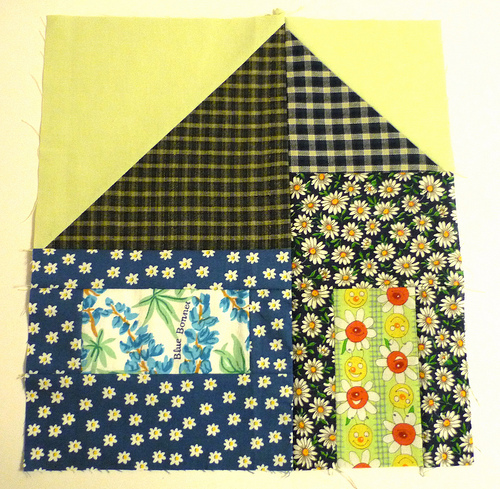 I love Beth's choice of fabrics for the house block! It's going to look so sweet with all of the others!! Ahhhh and the roof does look a bit like a sail boat!! That's so neat!! Hi, Rachael. 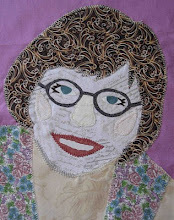 I'm enjoying your features of other quilters and your selection of their quilts--really beautiful. I also liked your Wild thing Zebra quilt--wow! Thanks for your tip about blocking Anonymous comments. i'll try to figure that out. 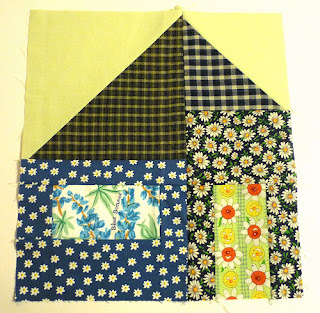 If only the all of us quilters were truly going to live in Daisy Town all together -- what a fun place it would be!! It was such a pleasure to contribute a block & I am *very* eager to see them all together. Thank you for Friendly Friday & thank you a Friendly Friday featuring me. 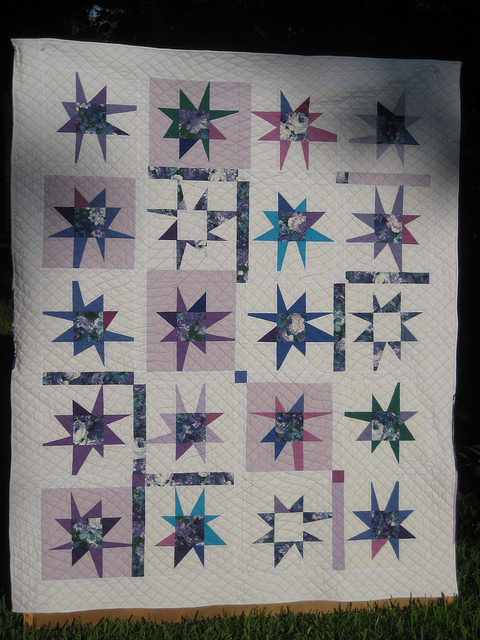 Now what fun for the quilters to live in Daisy Town Rachael...Loving your Friday interviews...Have a lovely weekend...and Happy Stitching and Bon Appetit! I'm in complete agreement with Beth about wanting people to let go of worrying about perfection and just enjoy the process. And her block shows just how exuberant letting go can be! Great philosophy, and yes, it should be fun! What a wonderful collection of completely diverse quilts ! I love Beth's philosophy about quilting. I often have to remind myself "it's only fabric "
Beth has just the right attitude! Thanks for another great interview! Another fabulous house! You sure have some talented bloggy friends. Hurrah for not worrying about matching things! Wishing you a good weekend. The weather is going to be great (for a much welcome change). It;s so interesting reading about the wonderful people who are contributing to your quilt Rachael. Thank you for sharing some of Beth's quilts, I'm off over there to visit now.